The floor boards of this little cabin are cold. The door latch is frozen, requiring me to use the dead bolt to keep it closed. The whole world has shifted into a creak, popping into sharp rearrangement. It is Monday. As though that means something, I enter the day like a new stage of grief. I’ll call this stage “Returning Home After.” It is another day of navigating life without Carl. It is after Christmas. After my grandpa’s funeral. After spending the better part of a week with my grandma, not just as her granddaughter, but also as two women who have lost the men we’ve given our hearts and lives to. There are not enough tears in the entire universe for this. I’m still dogged by the edges of this migraine that seems to have become my constant companion. A toothache has angled its way in, too. I’m chilled all the way to my center, not from sickness, but from the lack of warmth that crawls from my slippered feet and into my bones. My eyeballs feel like they’ve shrunk, become smaller from too many weeks of crying and trying to see what I’m supposed to do next. My grief habit of rubbing my brow has shifted to rubbing my eyes. The structure of mortality has taken on a physicality that I’m not entirely comfortable with. I am made up of tendons, skin and two eyeballs. Somewhere inside, yet beyond my precarious placement of bones and breathing is my spirit. My spirit gets curious, feels hope, gets out of bed to let out the dogs and feed the horses. I am acutely aware of the way my body is put together and, even in all its weakness, I feel like I will live to be a very, very old woman. This thought does not bring me comfort. However, in suspended moments, I see a glimpse of my future self. The woman I see is much older than me now. She is a bit timeless, grey-haired, her body and face have taken on new contours. Mostly, what I notice is her smile–a sense of contentment and satisfaction–that illuminates from the inside out. It’s a smile held in her eyes and her whole body. Anchoring her being is a vast aquifer–her life experiences–the depth and breadth of an entire ocean. It is as though she could hold out her arms and embrace a whole life of love, care, and meaning. There are a lot of young people in this image…as though her strong arms might gather in a whole world of children whom I love. This image comes to me at random times. It’s always brief. Just a glimpse. Last night she visited me as I read a book in the bathtub. Another time when I was driving. Once, while in the tea aisle at the grocery store. She has been weaving herself into me all along, but I notice her more lately. She’s cute and I like her. She knows I need her. She makes me smile even when I don’t think I want to. She pokes my ribs and is equally willing to wrap her arms around me. I know I’ll meet her someday, because I’ll be her. I already am her, partially. I just don’t recognize myself yet. I am rubbed raw from missing Carl. Saying I miss him doesn’t convey the actual experience. He hasn’t truly left me. Like today. Today I feel him near. Even so, it is not always easy wearing one’s spirit so close to the skin. I looked out the window this morning, watching the horses walk through the woods. Colorado comes to the fence first. I am mesmerized by how much I’ve loved that horse all along. I told Carl that I’d always want Colorado to be a little bit more “my” horse, even if he is the bigger, more skittish, less trained of the two. I wanted Carl to ride Dakota, despite him being twice my size and her being the smaller of the two horses. With more brazenness than I actually possessed, I announced that I would ride Colorado even tho the truth is that I was too scared to (and still am). Carl said he’d be happy no matter which horse he rode. I loved that about him because he meant it. He just loved the horses. And he loved me. My silly ideas were nonsense all along. It’s taken me a long time to truly bond with Dakota, but shortly before Carl died, I realized that it was happening. The deepening began to occur. It is still occurring. She has soft, worrisome eyes. And, lately, I find myself worrying about her, too. My heart is drawn to her. My heart is drawn to both of them. We are all like snowflakes. Even the horses. Today, this cold makes me feel cleaved open. Smooth, like frozen stone, old parts of who I was have completely worn away. There’s somehow room in this for something new. I move the milk house heater closer to my feet. I wrap Carl’s raggedy old quilt around me. I cry. I write myself back to life. 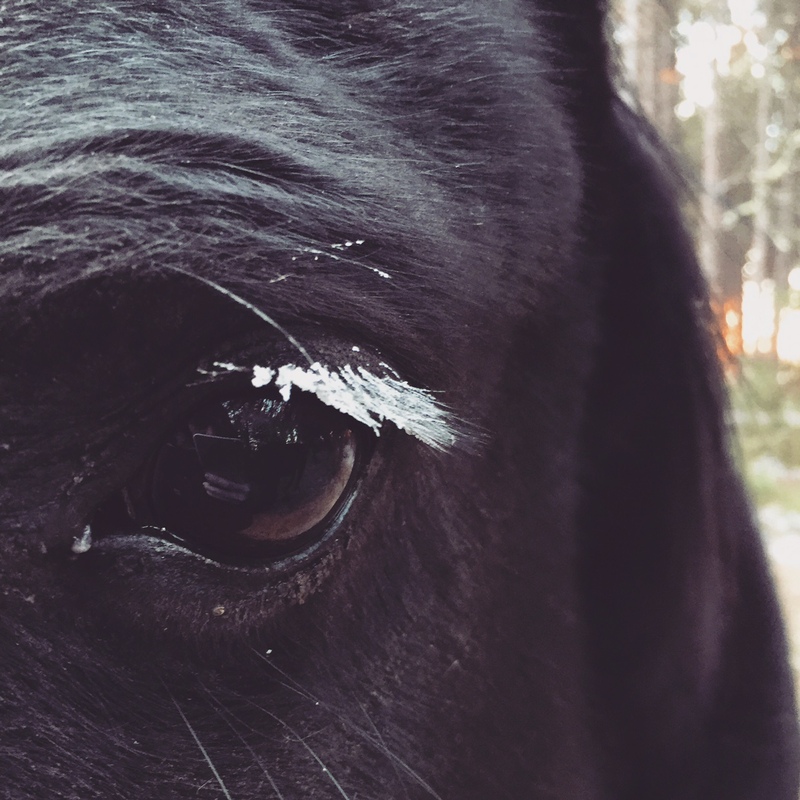 I feed the horses at sunrise, their eyelashes and muzzles covered in frost. Dakota lifts her front hoof up high in gratitude (her daily habit of thanks). Colorado eats up his sweet feed, tosses some hay around and then attempts to stick his big nose into my cup of coffee. I laugh at him and let him smell the warm brew, telling him “yeah…you’re my horse.” Colorado in front of me, Dakota behind me, Carl all around me. Slowly, I warm to the possibility of things I do not yet know. I love you, Carl. I love you for showing me the woman I want to grow to be. Posted on March 21, 2015 March 22, 2015 by jessiemarianiello	This entry was posted in faith, gratutide, grief, hope, horses and tagged faith, gratitude, grief, hope, horses. Bookmark the permalink.